"Webmaster Tools Labs is a testing ground for experimental features that aren't quite ready for primetime. They may change, break or disappear at any time." Well one of the Labs features "Malware Details" looks to be going Prime time. 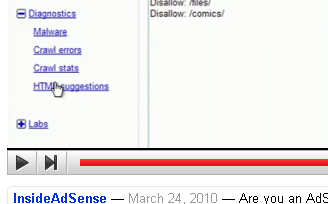 Although I haven't heard anything officially from Google about this, I did notice in a YouTube video uploaded by Google's InsideAdSense channel, that the Malware Details link had moved from the "Labs" category and placed in the "Diagnostics" category and labeled simply as "Malware". As most changes made by Google are first tested by their employees before going public, I guess its only a matter of time before the changes are seen by everyone.